Braided packing is an industrial seal made from braided strings of different sealing materials. It is installed between the spaces of adjacent machine parts to prevent leakage in fluid transport systems. Packing is typically compressed when installed and then expands to fill in any open gaps. Braided packing can be used to seal spaces between static joints or moving parts of a machine. It offers a quality seal that is pliable, chemical-resistant, self-lubricating, and very resilient. To create braided packing, manufacturers use yarns of different materials and construct them into braids to increase their overall durability, resistance, and tensile strength. These braided yarns are then coated with several different types of coating agents. Finally, the coated braid packing is treated with blocking agents to fill in any spaces between the braided fibers. The fiber materials used in braided packing include carbon graphite and synthetic fibers. Many industries rely on braided packing when undertaking sealing and valve repairs. Braided packing is a preferred valve sealant for industries that use heavy machinery because it provides a premium-grade seal for static fixtures and mechanical stability for moving assemblies. Chemical factories, oil refineries, and automotive plants depend on the high-performance of braided packing to keep their operations moving ahead flawlessly. Food processing plants and water utilities also use braided packing for their waterproofing their seals. 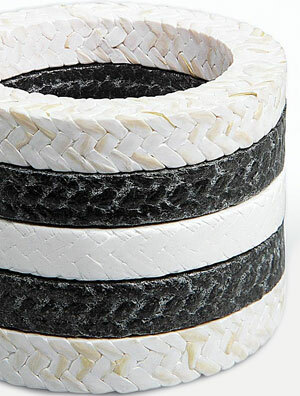 At Hoffmeyer, we offer a wide range of braided packing made from a variety of materials. We know you need the braided packing that best suits your needs, so we provide it in both metric and standard sizes. Hoffmeyer has 90 years of experience in providing high-performing packing and seals to various industries. Contact us now to get a quote on our braided packing line. Our trained professionals are available to answer your questions regarding the types of braided packing we offer.